Piper Jaffray Advises 24/7 Real Media, Inc.
24/7 Real Media, Inc. (Nasdaq: TFSM) is a leading global digital marketing company that offers media services and software products and services for advertisers and publishers. On May 17, 2007, 24/7 Real Media announced that it has signed a definitive agreement to be acquired by WPP Group plc (“WPP”), one of the world’s largest communications services groups, in an all-cash transaction valued at approximately $649 million, net of cash acquired. The transaction has been unanimously approved by the Board of Directors of 24/7 Real Media and a committee of the Board of Directors of WPP, and is expected to be completed in the third quarter of 2007. 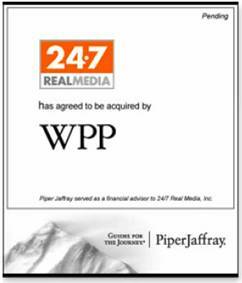 Piper Jaffray served as a financial advisor to 24/7 Real Media, Inc.
For tailored advisory solutions, contact us. Since 1895. Member SIPC and NYSE. Securities and products are offered in the United Kingdom through Piper Jaffray Ltd., which is an affiliate of Piper Jaffray & Co., incorporated under the laws of England and Wales, authorized and regulated by the Financial Services Authority, and a member of the London Stock Exchange. Piper Jaffray outgoing and incoming e-mail is electronically archived and recorded and is subject to review, monitoring and/or disclosure to someone other than the recipient. This e-mail may be considered an advertisement or solicitation for purposes of regulation of commercial electronic mail messages. If you do not wish to receive commercial e-mail communications from Piper Jaffray, go to: http://www.piperjaffray.com/do_not_email to review the details and submit your request to be added to the Piper Jaffray “Do Not E-mail” directory.